The Tour has a FRIDAY (9th June) evening 20/20 against famed local independents, the Nocturnes. It’s a 6 p.m. start at Beeston Hall School (Norfolk’s finest preparatory establishment). Directions will be available soon as part of a broader submission. SATURDAY (10th) suffers from long-term damage at the hands of cancelled/withdrawn fixtures. I have heard from more than one team member that a free day in the wind and rain of North Norfolk is a much-preferred option. 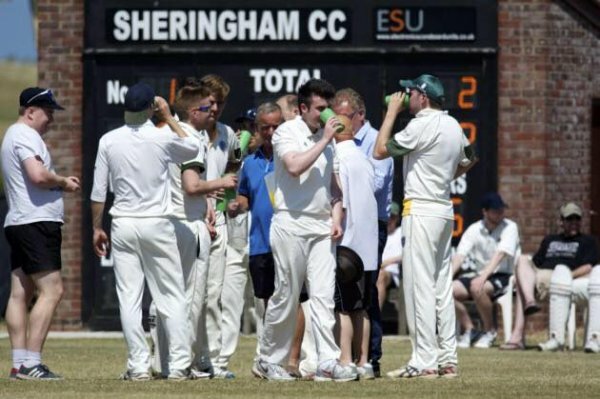 SUNDAY (11th) is a 1.30 p.m. start against Sheringham C.C. – like the Nocturnes, an avowedly friendly group of souls who seek only fun, beer and humiliation at the hands of Grantchester. The club has a fine setting (notwithstanding the a/w wicket adjoining the proper one): a view of the golf course; handsome horizons; and backed by the enormous Splash Leisure Centre for those who wish to swim or warm-down after the game. For those without health-and-fitness demands, there is a neat clubhouse and bar. There will also be the opportunity to view their handsome collection of roll-on covers. The Lobster Inn in Sheringham continues to await further bookings. All rooms reserved some time ago but there has been a slow take-up. You can reserve now by clicking HERE. Sheringham itself, entailing a 50-yard walk from the Lobster, offers decent dining at “The Bank” (Nepalese cuisine of a high standard: please support the Gurkhas). Another option is “No. 10” a trim boutique spot. Transport would, though, be needed (to allow good supping) at nearby Rocky Bottoms (in West Runton). It’s a bring-your-own-booze restaurant, owned and run by a local fishing family. Crabs and lobsters are a special delight – they catch their own along the beaches below. All three can be researched on-line. We will all make our own way to Beeston Hall on Friday afternoon. Those so wishing can book-in early at the Lobster, of course; but the landlord there tells me he’s happy with an anytime-arrival. Our own transport ought to suffice for Sunday’s game as Sheringham’s ground is on the edge of town.